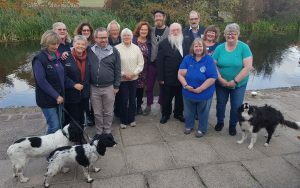 A chaplaincy familiarisation day was held at the Retford & Worksop Boat Club and we had 12 people attend in total, representing 5 different regions in the north and upper midlands. There was a lot of discernment and prayer, but also lots of fun was had by all, especially the exercise of constructing a raw egg carrier out of all sorts of strange and wonderful items e.g. pasta, marshmallows, string, a peg and a paperclip!! The idea being that we often have to work together and come up with new ideas, that involves team working, creative thinking and often the use of limited resources. I’ve done this exercise a few times now and no one has ever managed it, however two out of the three teams managed to carry the raw egg 30 feet, then drop if from a great height without it breaking! The 3rd teams egg broke, which was a reminder that despite our best efforts sometimes situations remain broken and we can’t solve everything, but this then brings us back into the realms of trust in God and prayer.